HERMOSA BEACH — Flamenco artist Mizuho Sato will celebrate 10 years of teaching flamenco dance in Los Angeles with a special show of her star students this Sunday, Oct. 6, at the Hermosa Beach Community Center, 710 Pier Ave. The live performance begins at 3 p.m. with singer Jesus Montoya, guitarist Antonio Triana II and percussionist Gerardo Morales. A 2 p.m. screening of the documentary “Kumpania,” starring Sato, Triana, Morales and guitarist Jose Tanaka, will precede the live music. Sato was born in Iwate Prefecture and started classical ballet at the age of four. With years of experience in winning balletic competitions, she pursued her career as a dancer and took summer school in the Royal Ballet Academy of England and later studied in Seville, Spain. Born in Iwate, she started classical ballet at the age of four. As she performed on stage and attained years of experience in winning balletic competitions, she pursued her career as a dancer and took summer school in the Royal Ballet Academy of England. Entering Sophia (Jouchi) University in Tokyo brought her a strong encounter with flamenco, and she decided to shift her career. The following year she was in Seville, Spain, taking classes from prestigious instructors. After her studies, she returned to Tokyo and started performing in several well-known tablaos. In 2000, she received awards from the Japanese Flamenco Association and the Spanish ambassador to Japan. Shortly afterwards, Sato started teaching in Tokyo and in her hometown. After touring with Manuel Reyes Company, she returned to Spain to study Spanish and further develop her flamenco skills. 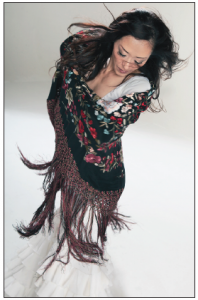 This experience led her to Los Angeles in 2004 to join Tanaka’s Soniquete Flamenco and start teaching in Torrance. Since then, she’s been performing at The Fountain Theatre in Hollywood, Alegria in Long Beach, El Cid on Sunset, and many more venues. Studying for the third time in Spain in 2007, she took intensive classes in Seville and Madrid. Back in California, she completed her fifth successful student show in Hermosa Beach in October 2009. In March 2010, she performed at the first annual Los Angeles Flamenco Festival in the company of Briseyda Zarate and in Tanaka’s group as a soloist.